Earlier this week Microsoft sent out invitations for a "mystery event" that will take place in San Francisco on Monday. But the mystery is unraveling early, with the release of slips and signs that suggest that Pink, the unfortunately-named, turtle-shaped slider phone, will be the star of the show. Ina Fried at Cnet announced earlier this week that a source confirmed the event would out the Pink project, more specifically two devices code named Turtle and Pure. Fried's hunch is supported by Phone Scoop, which reports that SanDisk joined the spoiler bandwagon by declariing that the Pink devices -- which Microsoft will announce on Monday -- will be compatible with the company's line of microSD cards. Way to go, SanDisk. "It's time to share. Let's get social. It's new, it's unique, living exclusively on America's Largest and Most Reliable 3G Network -- Verizon Wireless." Gizmodo touted a similar teaser (shown here) in March.And as we said then, what's the big deal? Pink was initially identified last April by The Wall Street Journal as Microsoft's "iPhone rival." The project, code-named Pink, was headed for Verizon's network in 2010. 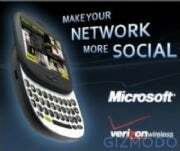 At the time Verizon's killer smartphone was the underwhelming BlackBerry Storm. Any word of a new smartphone (not to mention iPhone killer) was huge. Since then, Verizon has gotten the Moto Droid, Droid Eris, BlackBerry Storm 2, Palm Pre Plus, and Pixi Plus, and will soon get a version of the Nexus One. Of course, there is the ever-present rumor of an iPhone hitting Verizon's network sometime in the near future. Isn't anything with 3G, Web browsing, and a touchscreen just white noise at this point? Not to mention the fact that the intial Microsoft Pink announcement came on the heels of Microsoft acquiring Danger, the maker of the Sidekick. Perhaps Microsoft is targeting teens, much like the Sidekick. I'll admit, I'm not holding my breath for a groundbreaking announcement on Monday. I will say this; Microsoft has a way of taking a poorly-named, underdog products and turning them into forces to be reckoned with. What do you think "Pink" will do for the crowded world of smartphones? SanDisk public relations made a statement over the weekend to clarify the company's announcement last week. Spokesperson Kate Sternberg said in an e-mail that the company did not confirm any details about Microsoft's plans, but wanted to express excitement about opportunities in mobile electronics and "...consumers' growing demand for increasing amounts of flash storage memory on their devices." "The SanDisk PR team sent a handful of reporters some information about our microSD cards yesterday (Friday) referencing a widely anticipated Microsoft announcement on Monday. While we reiterated a launch date that has been widely reported this week, it was not our place to do so..." Sternberg wrote.